January 2012, I have a chance to visit Niigata, Japan to participate in “Water and Land Niigata Art Festival” and Mr.Yoshihiko Tanji is one of curator who invited me. As a few days visit, I was very impressed by the way of living and history of local people and city including their way to resolve their city plan to live homogeneously with natural disaster. This experience has inspired me to write this article “Internationality in contemporary art (difference in similarity and similarity in difference)” and made me understand the meaning of similarity and differences between art and culture from the past to present. This also make me have awareness of the hidden value in art and culture in daily activity (Ready-Made Culture) which I have been trying to collect them into the 31st Century Museum of Contemporary Spirit Project. Traveling is to learn and learning is the knowledge. The important knowledge is to discover yourself.The purpose of this project is to present the process of traveling to discover the value in ourselves. By making the city guidebook that shows a place which has a specific meaningful of each people in Niigata such as their backyard garden, former school or bedroom, it could be any places as far as this place has a good memory or a positive energy to them. This guide book is not intend only to show the major spot for sight-seeing or well-known places of the city but also show unknown places which might not be important to anyone but it has some meaning to whom suggest this place. Each place has its own historical meaning to someone who have self-experience and memorial to which other never had the same. This kind of historical knowledge from each person is the knowledge beyond the mainstream history. Some stories might have interesting history or specific knowledge of the places that we never known or realized and we ignored to exchange this knowledge to each other or public. This guidebook focuses on guiding others to the internal journey’s spirit and this should be “A Turning Point” to us to look back to our value in ourselves and in others. To create something, we have to realize in what we have, what we loss and what we need and our limit. On the other hand, to develop society, we have to realize our history, geography (macro and micro) and our natural resources from the past to present so we could create the future. 1. Asking for 10-20 volunteers to interview with VDO record the residencies (about 365 people or more) in the city about the place which has the most meaningful to them with their personal reason. 2. Gathering these information to publish as the Niigata’s Guidebook and the Niigata’s Map also need a graphic designer for the publication. 3. Providing the sign of 31st Century Museum of Contemporary Spirit and the detail of the meaning of each places. 4. (if this possible) I would like to speak and explain directly to the volunteers and to others who are interesting in this project about the whole concept of 31st Century Museum and the Niigata’s Guidebook before the project start. 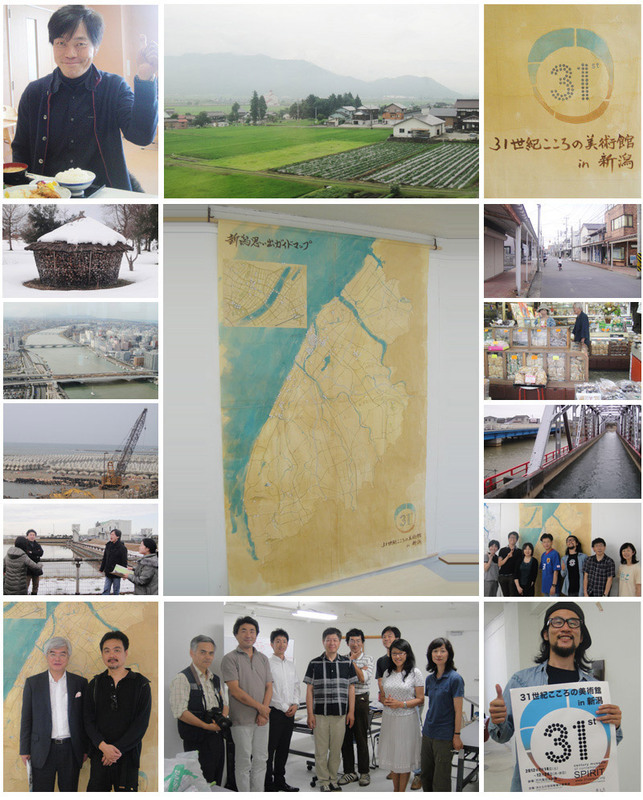 When Mr. Kamin Lertchaiprasert arrived in Niigata in order to survey the city prior to his participation in the Water and Land—Niigata Art Festival 2012, it was January—the heart of winter. The city was covered in heavy snows, the likes of which had not been seen in years, and the suburbs were buried in 20cm ~ 30cm. Despite the long flight from Chiang Mai, Thailand, upon arrival his movements were light and nimble, and he showed interest in everything he saw, asking us many questions. Among these, he visited the subjects of Niigata’s landscape, history, and people numerous times. 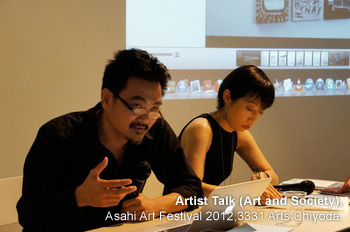 Of course, upon arrival in Niigata City, Mr. Kamin Lertchaiprasert had not yet prepared an answer within himself as to what kind of artwork he wanted to present in the Water and Land—Niigata Art Festival 2012. First, let us take a look at Kamin’s activities. After graduating from Silpakorn University’s college of print making, Kamin travelled to New York and continued studying print making at the Art Students League of New York from 1989 through 1990. During his enrollment at the Art Students League of New York Kamin accumulated real experience with expressive activities through individual exhibits, etc. However, in 1995 Kamin became interested in Buddhist thought and, incorporating art into his being, began exploring the possibilities of artistic expression. Since 1998 Kamin has been conducting “The Land Project,” which incorporates Vipassana meditation and cultural exchange; from 2002 through 2005 he organized an art experience space for young artists and intellectuals under the title “Umong Sippadhamma.” Kamin’s activities in recent years can be interpreted as placing value not on the appreciation of a constructed object, but rather on involving people in the process of artistic creation. During his stay in Niigata Kamin collected information about Chuo Ward and the Nuttari district of the city. Over the course of these activities it was the Kurinoki River that gathered his interest. In the past, the inhabitants of these areas had taken fish from the river, and played in its waters. 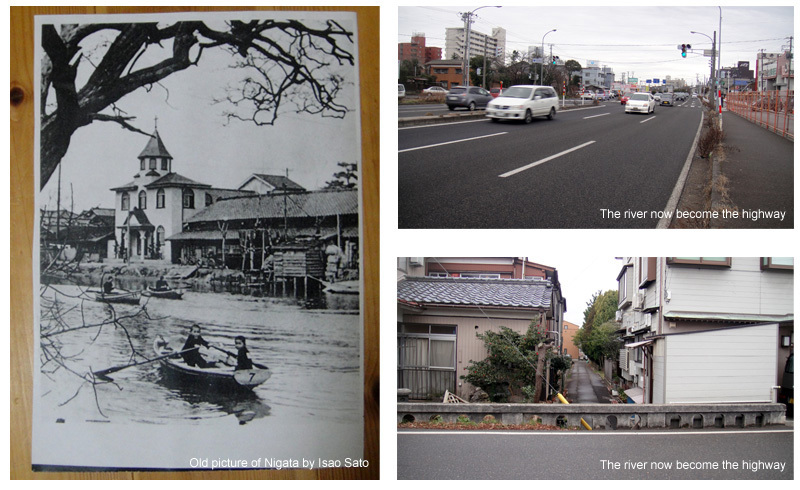 However, as the river was greatly damaged during the 1964 Niigata Earthquake, it was filled in and has since ceased to exist. In other words, the people traded away this river, which had been a part of their lives, for the sake of convenience. Based on this reality, Kamin examined the change in the landscape from the past to the present and spoke to us about the efficacy of the resultant image. According to Kamin, the purpose of this was not to simply induce a feeling of nostalgia, but rather to use the resultant reality to instill a new vision. Exploration of this reality formed the foundations Kamin’s piece for the Water and Land—Niigata Art Festival 2012, titled “The 31st Century Museum of Contemporary Spirit in Niigata.” Kamin had the people of Niigata present places of memory—places which, although they may only hold meaning for the people who presented them, represent some kind of story. At its end, Kamin plans to create a book out of the project. 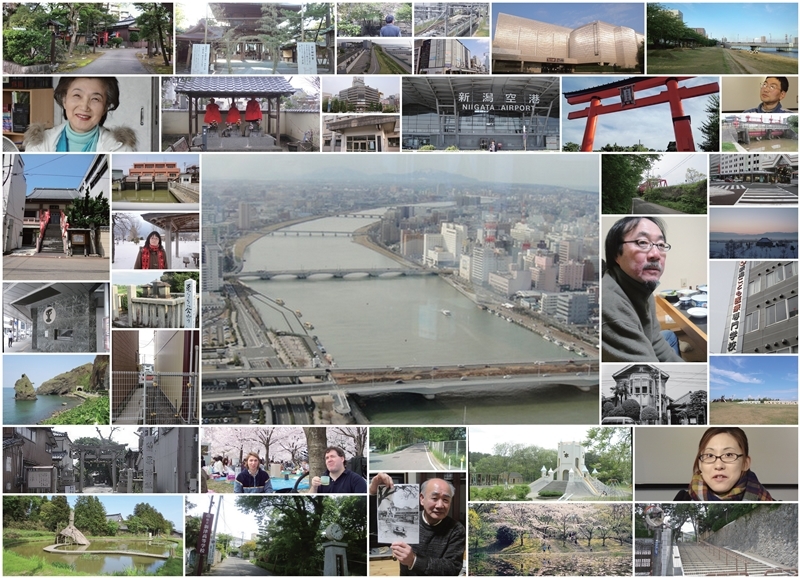 The people of Niigata have been the main actors in Kamin’s project, “The 31st Century Museum of Contemporary Spirit in Niigata.” The project’s format is not one in which viewers work to decipher the meaning in the images, but rather one that encourages the injection of new energy and activity into the community; this activity itself forms the actual project and artwork. Art is fundamentally connected to all things in this world; it is not a limiting force. Rather, art is a free space where participants can interact with whatever elements they wish. One could say that involvement with art is involvement with nature, science, medicine, and all other fields. Based upon this principal, one could also say that the 31st Century Museum of Contemporary Spirit in Niigata that the citizen’s of Niigata have constructed as a part of the Water and Land—Niigata Art Festival 2012 expresses everything from the field of art to the society itself. By being a part of the 31st Century Museum of Contemporary Spirit in Niigata the people may be able to create their own personal museums out of the connections between people and people, and the connections between people and land that are born out of this project. That is the heart of this project, the 31st Century Museum of Contemporary Spirit in Niigata that Mr Kamin Lertchaiprasert proposed. Date of issue: December 18, 2012.